For 44.999 years, Professor William Kielhorn did not miss a day of work at LeTourneau University in Texas. Rain or shine, the 79-year-old didn’t miss a class. Even when he was undergoing painful radiation and chemotherapy treatments while deathly ill from stage four colon cancer, Professor Kielhorn taught three classes a week. However, complications from his treatments landed him in the hospital, specifically Longview, Texas’s Good Shepherd Medical Center. Still, Professor Kielhorn did not miss class. 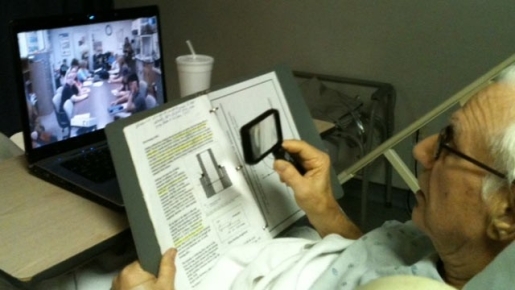 The professor taught his last class, “Manufacturing Processes,” from his hospital bed via teleconference to ring in 45 years of perfect attendance. LeTourneau University will be naming a computer lab after their incredible professor; his family will be in attendance. As for Professor Kielhorn himself, he is still in the hospital, but has been moved from the Intensive Care Unit and seems to be recovering his health. It’s nice to see that there are still some professional teachers out there willing to go above and beyond the call of duty.